An airport firefighter was killed and 13 of the 300 passengers and crew received minor injuries when an Emirates airliner made an emergency landing, then caught fire at Dubai International Airport early Wednesday afternoon local time. 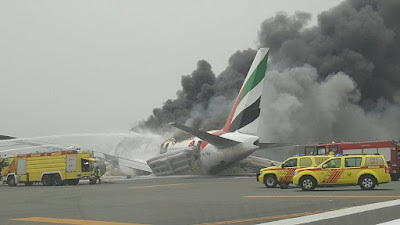 Flight EK521, a Boeing (NYSE:BA) 777-300, had taken off from Trivandrum International Airport (TRV) in Thiruvananthapuram, Kerala, India approximately three hours earlier, bound for Dubai (DXB). According to news reports, the pilot sent out an emergency signal shortly before the plane was about to land. Videos and photos on social media show the plane on the tarmac, leaning to its right side, as though the right landing gear failed to deploy or failed after landing. Pictures showed smoke billowing from the right side of the plane, followed by an explosion and fire. Twitter user @apaspo1957, who posted this photo of firefighters working to douse the flames, said the plane’s landing gear collapsed upon landing. For its part, Emirates was quick to provide information via its Facebook page and Twitter feed. The most recent update, which referred to the incident as an “operational incident,” states that there were no fatalities among the 282 passengers and 18 crew on board. The carrier is expecting an eight-hour network-wide delay. Six U.S. citizens were listed among the passengers; there were no Canadians listed on the passenger manifest.